This activity will help you to create a program to make your CHRP board into a line-following robot. After having completed the previous programming projects, you now know enough about the CHRP board and C programming to make a fully autonomous, line-following robot. This activity will guide you through creating a program that will allow a robot to follow a black line (typically electrical tape on a white or light-coloured floor). The program will use a simple, digital control scheme, resulting in somewhat jerky movements as the robot sweeps back and forth across the width of the line. You will be able to refine your line following robot to make it work more smoothly using the analogue techniques that you will learn in the next activities. The CHRP board is designed to be easy to build into a line-following robot by using two downward-facing light sensors (phototransistors Q1 and Q2), illuminated by an LED (LED12) to 'see' the line (check the schematic diagram for circuit details). 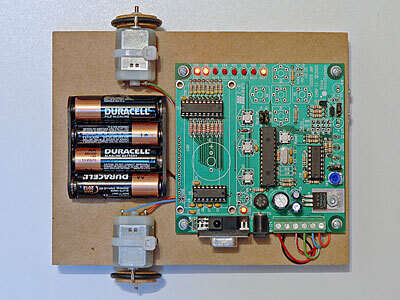 An easy to build, inexpensive and simple robot platform can be put together using inexpensive DC motors and 1/2" MDF. The line-following program will need to make decisions about which motor to turn on or off by sensing the amount of light reflected from the tape line or the floor. Make sure that your motor driver and motors are tested and working. Use the Output program to determine the values that need to be written to the motor driver to make the motors run forward, reverse, left and right. Having the left and right directions work by stopping one motor and running the other works better than reversing the direction of one motor (since running motors in opposite directions stops all forward travel slowing your robot's progress). Also, be sure that the floor LED (LED12) and the phototransistors (Q1 and Q2) have been installed, aligned and tested using the Input program, or the CHRPbot program, below. Test your robot by holding it and physically moving it across a black tape line to check phototransistor alignment. As the robot is moved across the line, from one side to the other, one light sensor should 'see' the line first, then both, then just the second light sensor, and finally neither sensor. Check that this sequence works the same way, from left to right, and right to left, across the line. If the sensing sequence is not similar as the direction of sensing changes, adjust the position or aim of either LED12 or the Q1 and Q2 phototransistors. Stop. This would be the simplest course of action, but having your robot just stop and give up doesn't make for a very effective line-following robot. Reverse. This is another simple solution that assumes the line must be somewhere behind the robot, and by reversing the robot should be able find the line again and try to continue along the path. Do the opposite. A slightly more complex course of action that makes the assumption that reversing the last mode of travel before leaving the line should return the robot to the line. It's more complex because it needs to know the prior state — which direction the robot was last travelling before it left the line. Freedom! Line? Who cares about the line? The robot is free to wander forever (or, at least until its batteries run out)! Unfortunately, this solution does not make an effective line follower since it makes no attempt to get back on the line. Search. This is a more complicated solution. It would have the robot use a circular or geometric search pattern to look for the line. This would work best if the robot could adjust the speed or amount of travel of each wheel so precise turns could be made. Practically speaking, reverse is usually a good option since it is quite effective at returning to the line, and works with a minimal amount of extra code. We will start with the Input program, since it's already set up to get input from the phototransistors on Port A. You'll need to modify the program to perform a sequence of conditional checks to check each of the phototransistors in turn. The flowchart in the following photo shows one possible solution. Translating the flowchart into working code results in a program that contains multiple if-conditions — the diamond structures in the flowchart. Start by creating a new project in MPLAB. The CHRPbot project uses the same files as the Input project, but requires new CHRP3.c and CHRPbot.c files. All the files are listed below for reference. Add CHRP3.h to the Header Files section of the MPLABX project. All of the .c files belong in the Source Files section of the project. Next, create the CHRP3.c source file. Finally, create the CHRPbot.c source file. This main CHRPbot file is not a complete robot program. Rather, it's currently set up to test the light sensors so that you can verify their operation and calibrate their aim. You can add-to and modify this code to make it into your robot program. 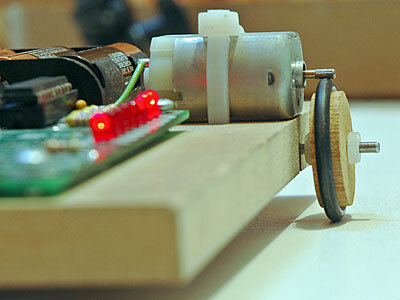 This program uses digital input to make a line-following robot. Use .75"
black electrical tape on a white background (while melamine board or tile). What binary patterns do you have to output to Port B to make your motors turn forward, reverse, left and right? Define them in your source code using #define statements. Using your programming skills and knowledge of inputs, outputs, and decision structures to create a program that enables your CHRP-based robot to follow a black tape line.